That doesn’t just mean I like to see the earth go through rebirth over the year- I really love the changes of life’s pace. Summer is not only lush and warm… humid and green… but it is full of life. The days are long and exhausting but we revel in the activity and drink up as much sunlight as we can squeeze out of each day. The woods are noisy with birds and animals. As a teacher my work slows down leaving me able to spend lots of hours outside – my heart is in the barn and the woods, but also the yard is in bloom and things grown in the garden. We stay outside into the night with friends drinking wine, or margaritas… or mojitos… and laugh easily and often. 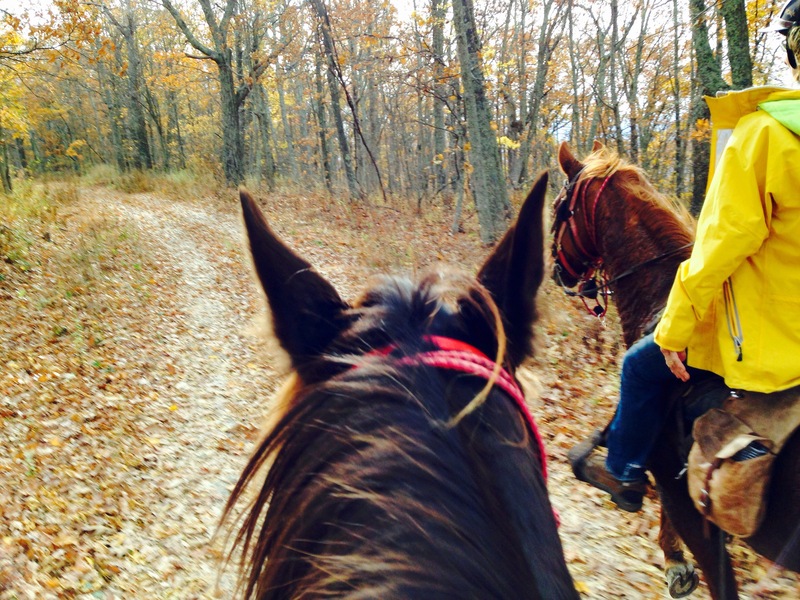 It’s also the height of ride season and next year I hope to do at least an event each month with Khaleesi through late spring to fall… summer! Summer gets exhausting after a while. 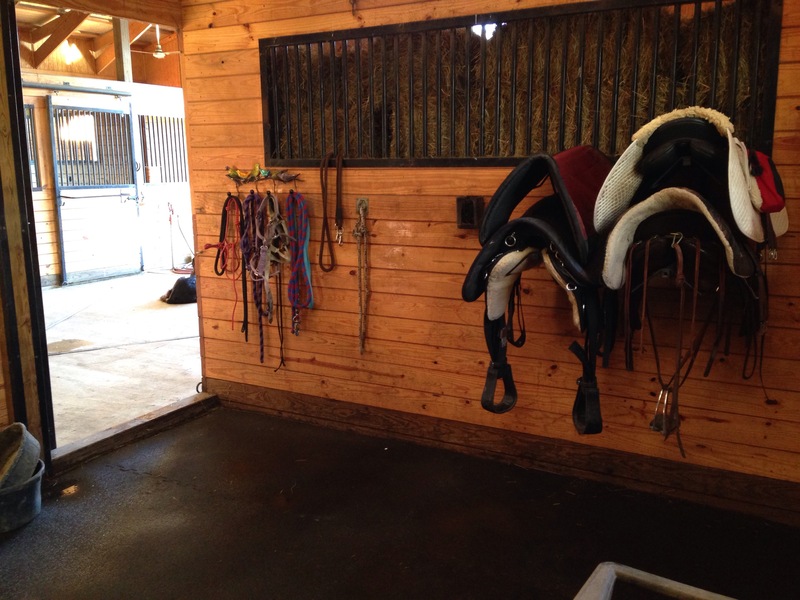 And the heat gets tiring… humidity draining… tack and boots seem to mold overnight. 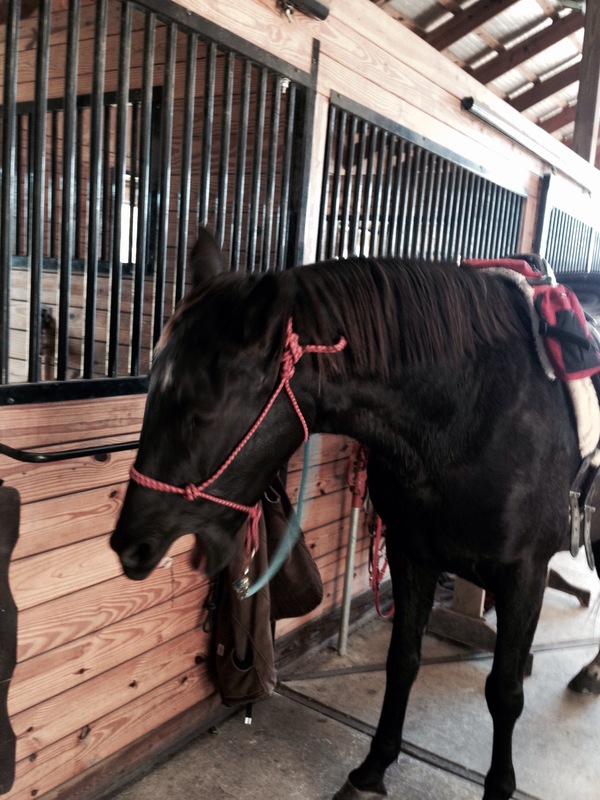 Our horses are always sweating and we worry about dehydration and overheating at rides and in trailers. You dream of a shower if you are camped out without one but on the other hand get sick of wondering if there will be a thunderstorm every single afternoon for the rest of your life. 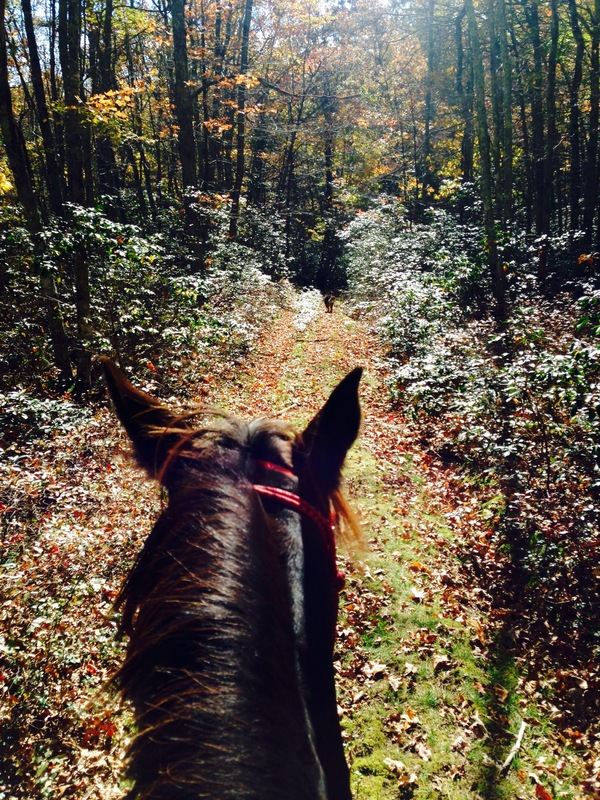 Fall comes along and brings pretty colors and trails and tack begin to dry out. 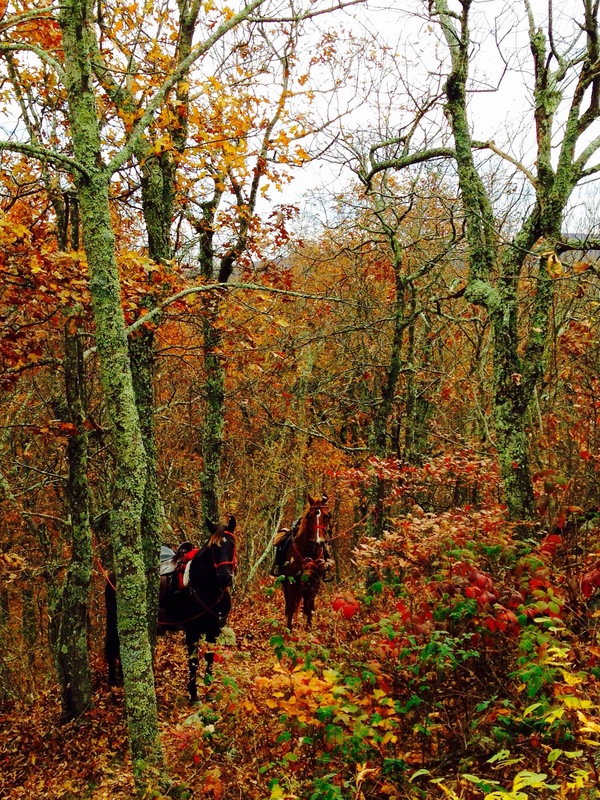 The woods are stunning and the cooler temps are a godsend to your exhausted horses- though they are fantastic shape right now. 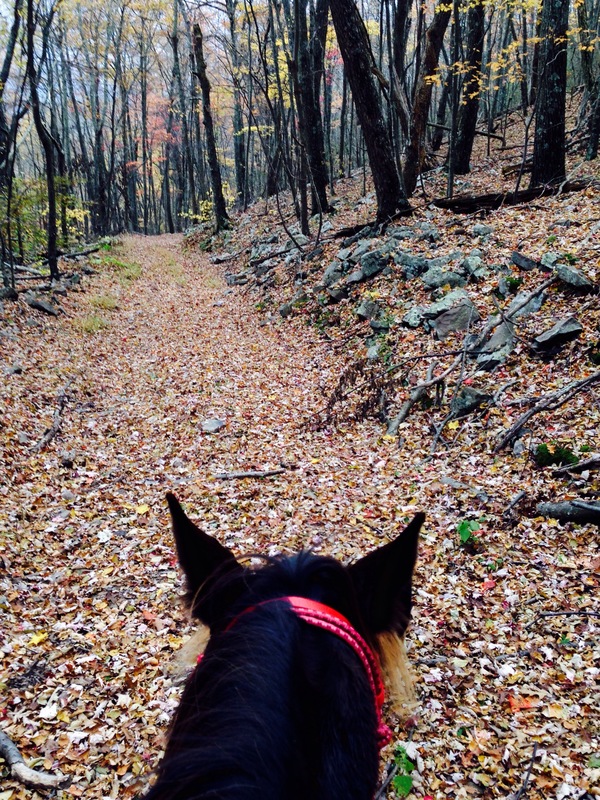 This is why fall riding is “the best” – in shape horses, beautiful views, dry trails and cooler temperatures. As the days get shorter and the leaves disappear this perfect riding gives way to winter which means parties must be held indoor, thus are usually smaller and cozy. You begin to talk in depth with your friends again over scotch or bourbon and the wood stove. It gets dark earlier and you begin to ride 2 hours or less in the warmest part of the day or risk loosing a toe to frostbite. The trails are often soggy and slick and half frozen. You worry about the storm that’s predicted and promises to dump 36 inches of snow and freezing rain… do my horses have enough hay until I’ll be able to dig a path back to the pasture? Will the water freeze? To blanket or not to blanket? Work gets busy for me, but as riding hours are fewer it’s a good time for tradeoff. Also it’s quiet, the nights are clear and the stars blaze in the darkness. The stillness is good for the soul and there are a few perfect clear days after a snow when you can ride in the powder sugar forest and see the coyote and turkey tracks as clear as your dogs can usually smell them — nothing else has come through except you. Just as you think you will go stir crazy from being inside as much as possible and sick of slippery footing and short rides everything begins to melt and the cycle begins again with spring. Probably my least favorite time of year the trails go from frozen to slushy and refrozen ice rinks, your horse is not only covered in mud but also shedding out a thick winter coat and you look like either bigfoot or the abominable snowman every time you try to clean one up enough to ride. Raining ruins your riding plans the most in spring- and it’s usually a COLD rain. The only saving grace is those few days that are JUST RIGHT and the sun shines warming you enough through the window that 50 degrees feels like you might just pull out your tank top for this ride (then go outside to realize you actually have lost your mind through the winter). At least in spring you know what is coming, and winter helped you rest up for the busy riding season ahead! That’s ok. The woods that were ablaze last week in color are now looking sparse with a few leaves floating along on the breeze. 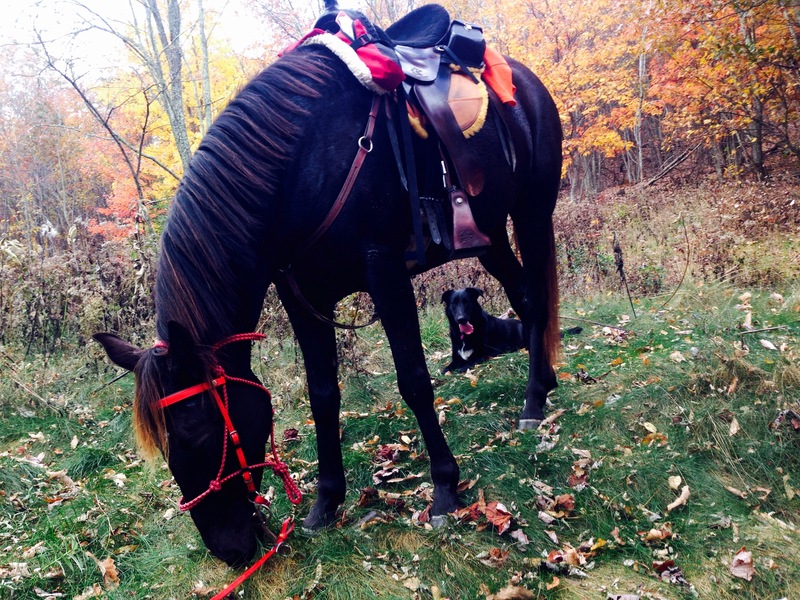 I took Faygo out for a really nice ride and enjoyed the time with her scoping out some new trails with my GPS- this is something I don’t do often with Khaleesi as I usually have riding mileage/speed goals with her and have been enjoying that process. Faygo however continues to struggle with hard riding so this was a great way to enjoy the first November afternoon of riding together. Also since I have been able to dial back my riding program without feeling guilty this year (a rest season is good for the horses too! 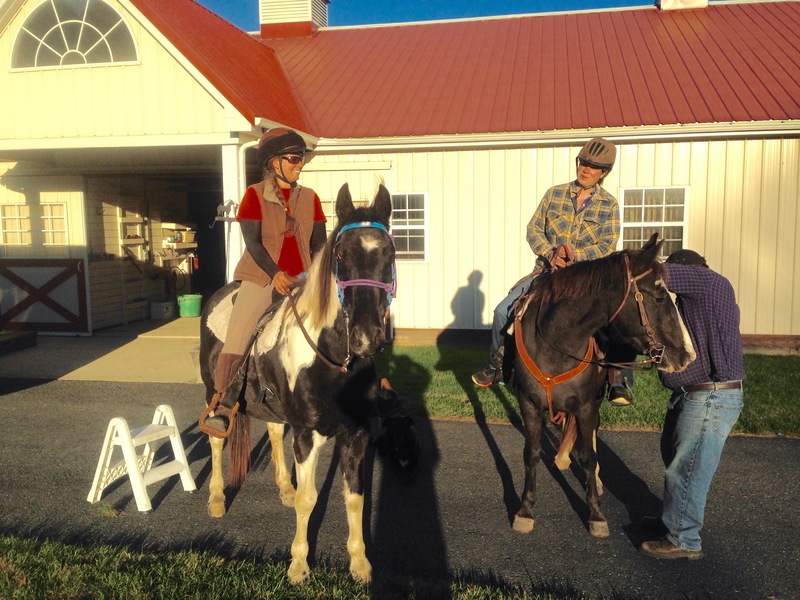 ), I’ve been able to spend some time helping friends with their equine life as well. I’ve been given a lot in my horse journey and if I can pass anything along and give some of my time to other people it’s the least I can do. My girlfriend lost her horse recently and had already been looking for another for the family so she ended up taking on two rescue walking horses to see how they’ll do this fall. 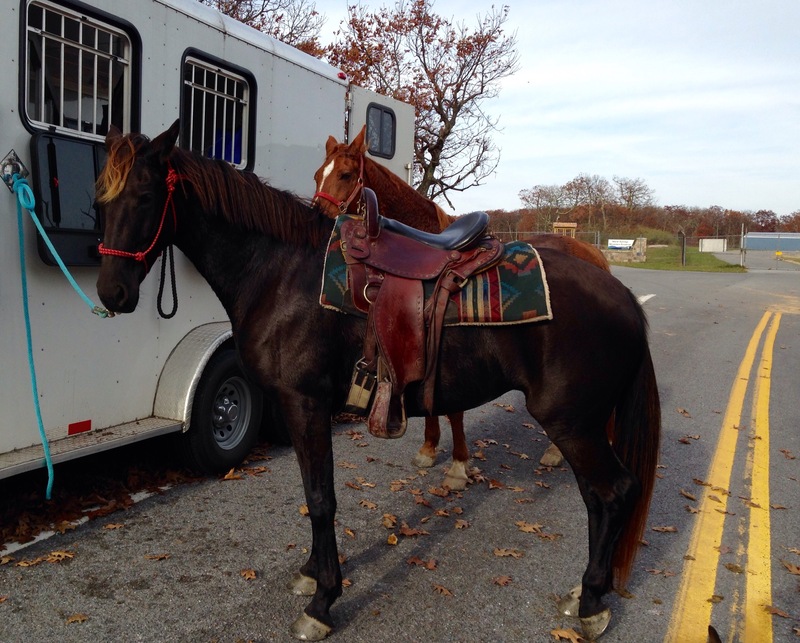 They are nice horses but will be projects to refresh their training and get them on the trails again. They have good foundations and I think have good potential and are not beyond the capability of my friend and her family, but it will take some work, and nothing is guaranteed. I found this year there is a difference when you have to put some work into your horse than if you get one fully trained and ready to go by someone else- it’s a good process to undertake, and for her teenage son who wants to ride one of these geldings I believe having to invest some time into the horse is important to understanding it’s an animal and not a motorcycle. I hope to help them out in any way I can along the journey. An issue they will be dealing with in one horse is “barn sour”. This is something I’ve had to work through with Faygo since I began riding her. It’s gone through many phases from minor and slightly annoying to, at it’s worst (brought on by the lymes and back pain) downright dangerous and scary. 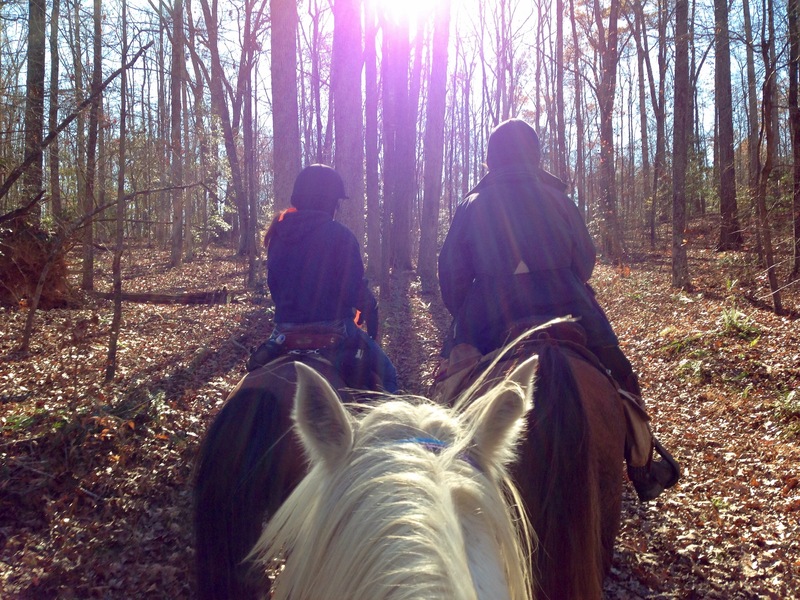 We took out both geldings to see if they were even worth considering, and traded horses on the way back so we could get the experience of riding both. We did the switch after barn sour gelding started his push for home. I was glad to see when my friend dismounted and I got on he stood quietly even though he wanted to go. I believe is somewhere mid range on the barn sour scale but certainly needing improvement for a rider to enjoy him. He was never dangerous or out of control but he was pushy and hard to hold back. Today I found Faygo to be more pushy than usual (she goes in cycles and we hadn’t ridden alone in a while); since I knew I’d be helping my friend I was very thoughtful in our training as we headed home. Through the years I went through lots of trial and error with her from a harsher bit to jerking her and trying to slow her down by force to finally realizing I was not going to ever force that horse to do anything. I had to get to her mind. When she was at her worst is when I was forced to be at my best and I got serious about the barn sour habit. I don’t know if you can ever make a horse NOT barn sour at all (though I won’t argue this point, anything is possible). Most horses to some extent like to hurry home- but you CAN have a horse that respects you and doesn’t become dangerous, out of control, or pulls your shoulders out of joint. For Faygo I tried lots of approaches- once I followed advice to make the work harder… circle your horse and get her to see that it’s much harder to push home than to walk nicely. In our case (and I believe most horses) this only made the energy go UP UP UP and she got more fired up the more circles I did. I had to get off her to lunge her without feeling like we were in the rodeo then get back on… It was more dangerous because now she was barn sour, intent to run home, and adrenaline UP. I thought this over and decided in her case we needed to bring the energy down. Instead I began to turn her around- one rein U turn (not facing home) and then ask her to side pass.. back up… forward two steps… anything I could ask that wasn’t walk home but that made her think about what I wanted her to do and get her focus off of running me home. If she was bad enough I’d get off and do groundwork right there. Calm deliberate groundwork, not fast animated circles. This helped. She’s naturally a hot headed horse though over time I find her to be softening more and more. I am always interested in keeping her adrenaline down when we’re working through something. Over time I came up with a new game: the tree maze. This is what I used today as we got closer to home and she was pushing me. In the tree maze- every time she went from her fast walk (which I allow) to a foxtrot gait (too fast) I would practice going off the path and winding through and around trees. I work on our communication – I look first where I want to go, then use my shoulders and eventually rein if she doesn’t “hear” me. For us this works great and connects our communication better as well. She is so good that eventually the softest ‘voice’ of just looking through random trees will snake us around the woods on a diverted path home. I could feel her dial her pace back just a touch to avoid having to go off trail without a rein cue from me. To top it off, she is so smart that she would only start to push into a gait when the sides of the trail were either so dense or so steep she KNEW I wouldn’t make her do it. Then immediately pull back a few steps later when the trail opened back up again. Again I had to outsmart her- so I decided in those sections I would just turn her around and do side passes and back ups then turn back around and continue. Eventually she realized this and we walked home. Loose rein. Granted we walked fast- but my rule was as long as it’s a walk I’ll take it. I always start by asking myself what I am doing to contribute to the problem. I believe all great riders start here and hopefully it’s the easiest thing to change first (our own behavior or energy)! I think many of us are just a step ahead of our horses. We anticipate what they have done in the past and I wondered if I might be telegraphing her speeding up in places she’s done it before to basically create a self-fulfilling prophecy. 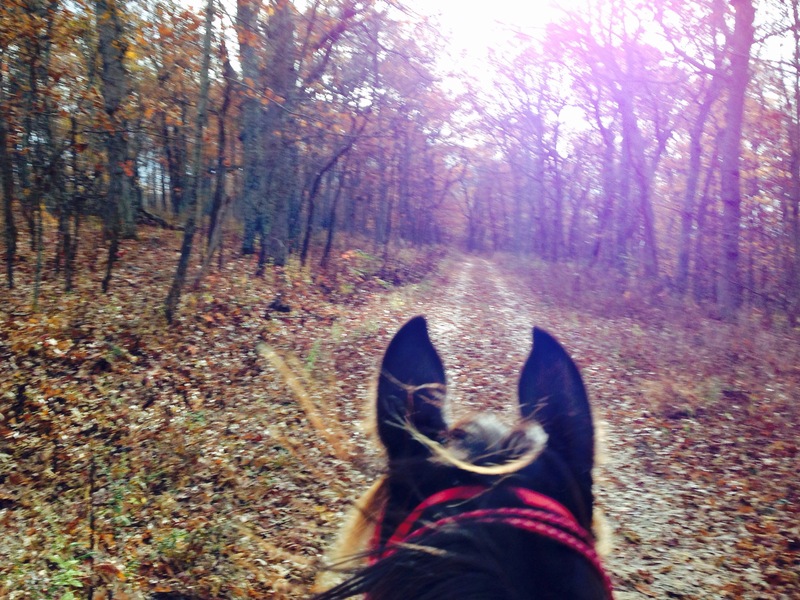 As we ride the familiar trail home I know I think to myself “here is where she always speeds up that little hill…” or “this is the spot she always tries to run past where the other trail meets” and in doing so am I creating some of this energy? 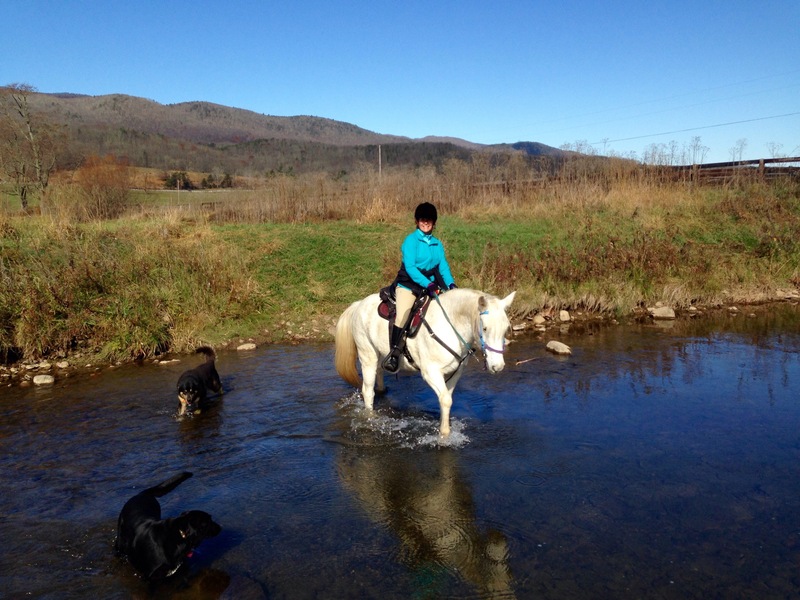 Like another friend who has occasional trailer loading issues… does she sometimes worry to herself “I know he’s not going to load” and send out that energy to the horse who feels there must be a reason to be worried about this? How about another friend who has been working on getting her horse to not drag on the lead and move with her when she jogs out- she said her horse is starting to jog sideways with it’s hind end out to the side… we figured out she had gotten too used to popping the lead rope behind her to ask him to move out without even giving him the chance to move correctly (or incorrectly) first. I tried to get control of my brain and really think the slower footfall rhythm and energy and using my Jedi training assume she would NOT try to speed up in those known areas, but instead keep my energy down and the rhythm and energy dialed back. I believe it made a difference. In riding this way more and more there are moments when I can feel her energy in a split second ask my energy a question “can we canter up this hill please?” or “I’m tired and hope to slow down.. can we?” and often my energy answers with a “yes lets go!” or “I was just thinking we should slow down for a bit”. And I’m working on stopping my horse without rein if at all possible- and not really with my seat either, but as Pam and I talked about I try putting my energy to “Zero”. I have literally stopped saying “Whoa” sometimes and actually say out loud (though it’s mostly to myself to try to help my energy as much as possible since I’m not a Jedi quite yet) “zero”. 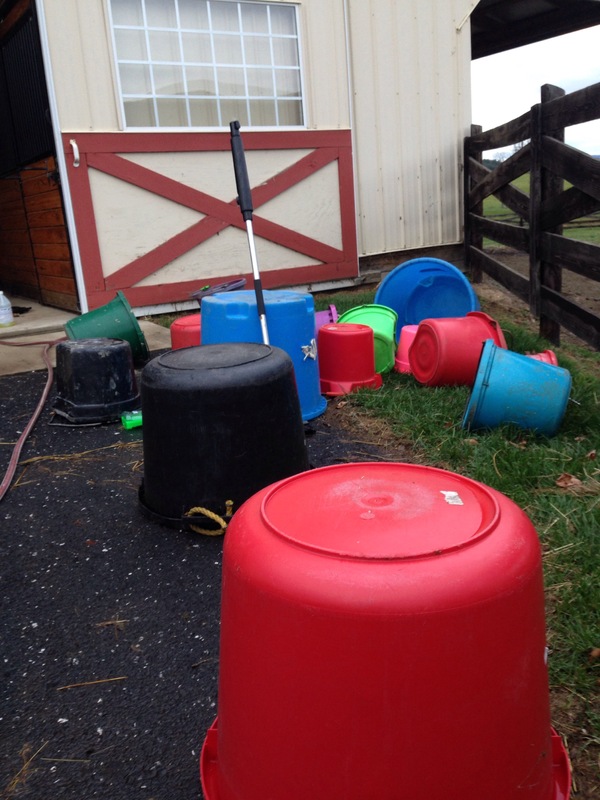 When we did make it home and were approaching the barn I did this and bam. “zero.” She stopped. At some point in riding Faygo, I decided that I will not pull on her face to get her to listen- I expect her to go the speed I ask and not faster (or slower) until I change the speed, and hopefully someday stop when my energy says “zero” every time. 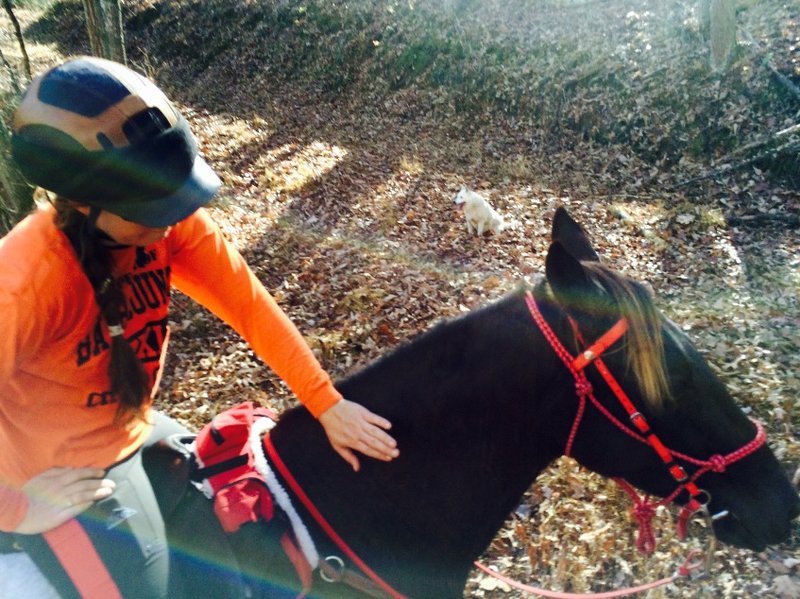 This isn’t easy- with Faygo going home the challenge was to keep her from trotting me in, and we did it today. With Khaleesi it’s mainly keeping her moving – my energy needs work too. I have found that sometimes I’m asking her to move forward, but I haven’t changed my own energy into a trot. When I do it’s more effective. Also I’ve ridden in a group where the energy is forward and away we go- 6mph easy with a forward friend, but in a group with a lower energy level I might put her out front and try to set a slow trot and it’s pulling teeth- the other horses are lagging behind and she feels the group energy stronger than mine. 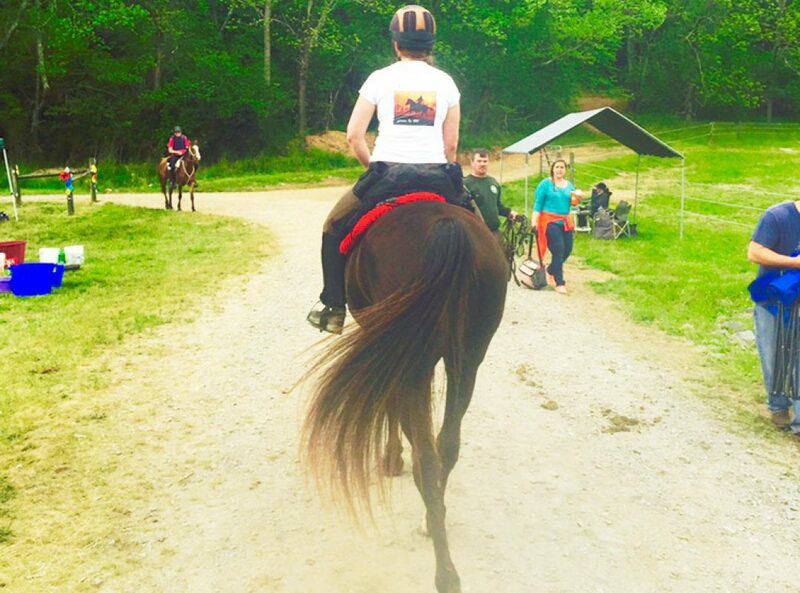 She can speed up or slow down without me asking- and most of us as casual riders let the horse choose the speed often. I’d like us to be more fine tuned than that. The one thing that I don’t like about group riding (more than 3 people) is that I find the speed changes ALL THE TIME. A horse gets in front and goes out a few steps, then lags back to a walk- then fast walk- then slow walk-trot/gait a short distance… the pace never seems to find a groove (except sometimes in the case of walking along for stretches). I have ideas for barn sour Faygo, but I tried to think about how to encourage Khaleesi to keep moving. In the arena when she’d slow down in a corner I’d use a dressage whip (just a tap) to answer the question for her “Can I slow down now?” I may experiment riding her alone on the trail and work on my energy forward and bring the dressage whip as a tool to help us communicate without me having to kick and push her from my legs- I want her to be more responsive and not dull there. I know she can move out, and she’s in plenty good enough shape. It’s kind of nice to know I have a horse in her that is capable of a mellow ride and a fast one depending on what we’re doing. Ironically with Faygo, who needs to mellow out due to breathing limitations, is always pushing on hot and fast. Dialing her back is always a struggle. All of this seems to come back to energy and pace to me the more I think about them. Faygo needs to slow down sometimes, and Khaleesi needs to keep moving at a steady trot. Both of these we work on more effectively alone- then hope our work and energy translates into group riding. That is one of my winter goals- to find some groove in our pace… and to help my friend’s new barn sour rescue learn to walk in under control. The white patches and sore spots on Khaleesi were a nightmare when they were happening, but now I am thankful they pushed me to reevaluate our saddle situation. This is a good time to get on top of that and if our saddle had been working ok, I may not have bothered addressing it until we were in the middle of next season and then it becomes a frantic scramble for anything that works. I rode in the Synergist for the second time on an alone ride last week and though I still loved it, the honeymoon was over and the real test was starting. 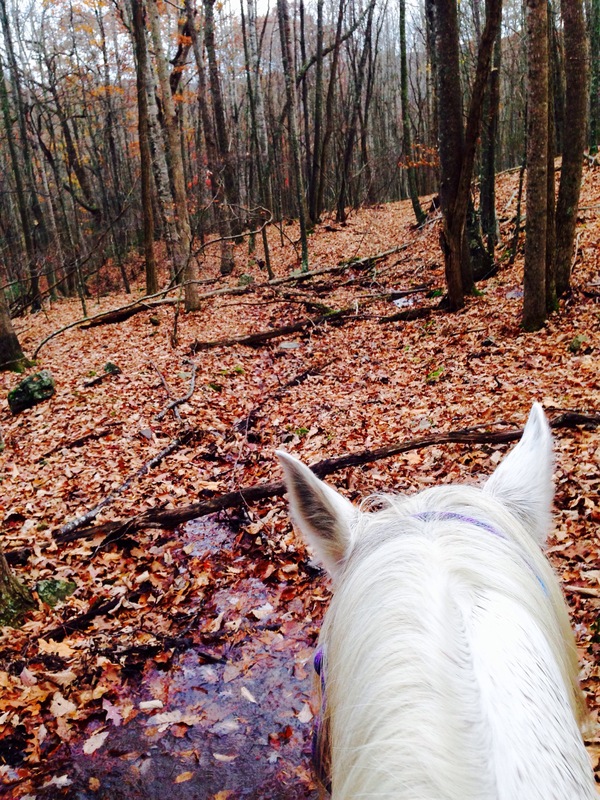 She was not as naturally forward without buddies to ride with and we went through tougher terrain- through berry briars I had to reach down and cut from in saddle, and my “mountain laurel” trail is beautiful but thick with laurel that I always clip as much as possible on the walk up the mountain. She did great as I climbed around her back like a monkey at times trying to do as much as I could without getting off her. The saddle still held me in place and didn’t move around on her back either. I mentioned in my last blog that the only thing that concerned me was a slight discomfort in one knee when I got off. As soon as we started out I began to feel that same knee was bothering me. I shifted my weight wondering if I wasn’t riding centered- one leg longer, more weighted than the other. Nothing seemed to quite fix it so I got off and checked. Sure enough one stirrup was longer than the other. Once I corrected this my knee immediately felt better and we were good to go. I hadn’t ridden in this area since the “run through the jungle” post as you have to cross the clearing that had grown up with briars and that is where we saw the rattlesnake in the summer. Since this is mid-Fall I decided to take a chance: the snakes should have gone away as we’ve had some frosts overnight and the jungle should have died back at least enough to manage. It was as stunning- the colors are gorgeous and the weather was perfect. 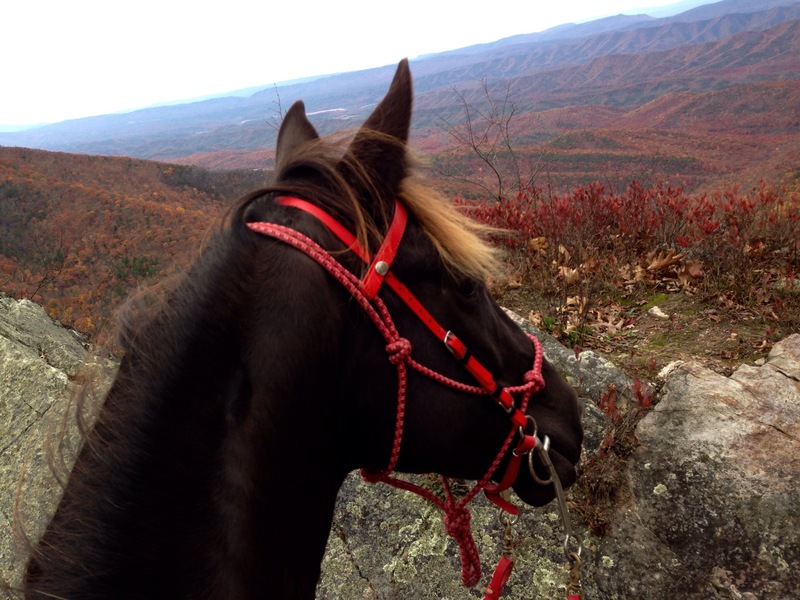 Once we climbed to the top of the mountain and got on the ridge trail I asked Khaleesi to move it on out and she chose a collected canter that was really nice. On the way back down the roads are wide and easy to ride but we slowed down due to the downhill incline. There was a mess of downed trees along the path at one point that we couldn’t get through. Of course this is the one spot where the woods were very steep on either side of the road and I got off to see if I could pick our way through and maybe cut a branch or two. No way. It was a thick mess and some of the branches were too high to walk over. I look up one side. Way too steep. Big boulders. This area is rocky, and the rocks are piled on each side of the road. The footing was loose and leaves made it tough to know for sure what we were getting into, but this was the way home. Definitely safer on the horse than off, so I get back on. Khaleesi: Nope. That is a bad idea. Let’s just turn around here and go back the way we came. Me: That’s like 10 miles back instead of 4 miles home. We can do this! Khaleesi: I don’t really want to go down there. It’s steep… Cut the trees with your saw! Khaleesi: Ok, but for the record, I don’t agree with this option. She steps off and we slide down the 4 feet or so on her hind end, my feet could be on the ground if I let them and she handles it like a champ until we find some decent footing. It’s rocky under the leaves but we can walk it slow and pick our way through along the side of the hill… now getting back up is harder. It’s only about 4 feet up- of loose ground with rocks and I’m not sure if we’ll be able to scale it- but we need to be back up on the road. Before I can think too hard about the best place to try for she makes the call and starts to scramble up. I help her as much as I can staying balanced and holding onto her mane and say a little prayer we don’t slide back down the mountain together and she miraculously gets us up onto the road on solid ground and all I can do is rub her neck and tell her she’s the best mountain horse I could hope for… I make much of her. Part of the rocky lined road- we came up on some downed trees ahead- the incline on both sides was steeper there. I was glad to be in that saddle and not a little english wintec for that detour, but also for the trail clipping and offroading. I like the wintec, but the more I’m trying other saddles the more convinced I am that a more substantial saddle is going to be good for both of us on long rides and off-trail rides. As for the Synergist- it is still a leading choice. I have been in contact with the owners of the company (CJ) and after a wither tracing she told me the saddle I’ve been borrowing is built on a medium tree and we would be better suited to a wide. This makes sense because the fit is decent, but I thought there were a couple almost dry spots after riding. Not big patches, but enough to think it might not be perfect. The next saddle on the list was an IMUS or Gaits of Gold or Phoenix Rising depending on when you got it and what you call those products. Brenda Imus is the person behind the line of bits and saddles, she has since passed and her daughter Jamie Evan is running the company and it is better than ever. The customer service is phenomenal and the products are high quality. I settled on a Phoenix Rising saddle for Faygo and absolutely love it. But would it work for Khaleesi- totally different horse with totally different movement? I sent pictures to Jamie and a whither tracing and we decided that the standard tree is most likely the best choice for her. 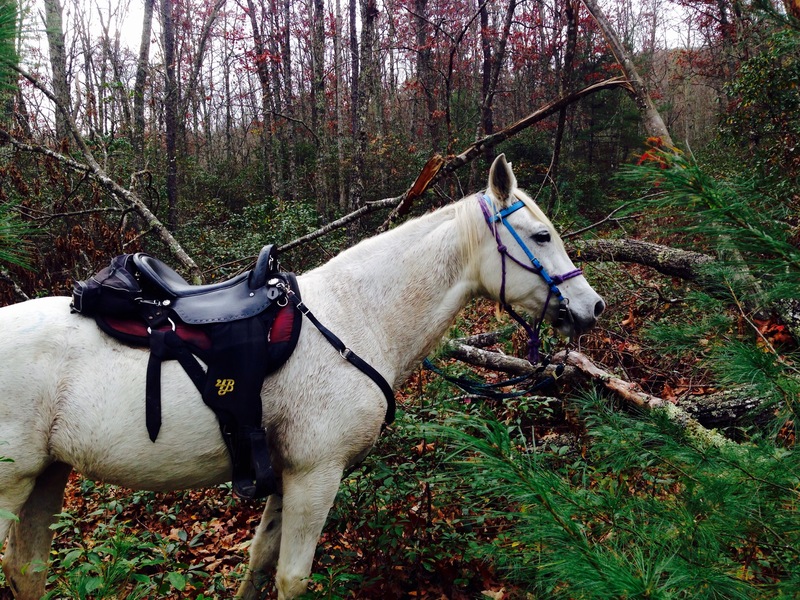 (Faygo has the wide tree- so her saddle wouldn’t fit as well). My friend Carrington is the one who first introduced me to the saddles and she happens to have an extra standard tree that I could ride with her in (it is one of her other horses’ saddles). We met to do a test run… and I do mean run. We had been talking for a long time about doing a fast/flat ride with her Saddlebred (Ned) who loves to go go go and just hadn’t gotten serious about setting a date and making it happen. In fact- we hadn’t ridden just the two of us in over a year except for an hour or so during a camping trip at the end of a group ride (we went back out after the group ride for a few more miles). So we finally got serious and made a date to meet up at the local airport on top of the mountain and ride across and back, we figured it would be about 20 miles. I brought a saddle of my own just in case, but the older Imus fit her perfectly and we were good to go. I wasn’t sure where the stirrups would be best and the first 2 miles they were too long and I felt uncomfortable and unable to balance. I stopped to shorten them and voila, it was perfect. Funny how stirrup length can make or break your knees, legs, and experience. Once I had myself adjusted the saddle was incredibly comfortable to ride and easy to balance in. The seat was slightly larger than mine, but didn’t bother me at all. The free swinging stirrups could go wherever I needed and posting was no problem. 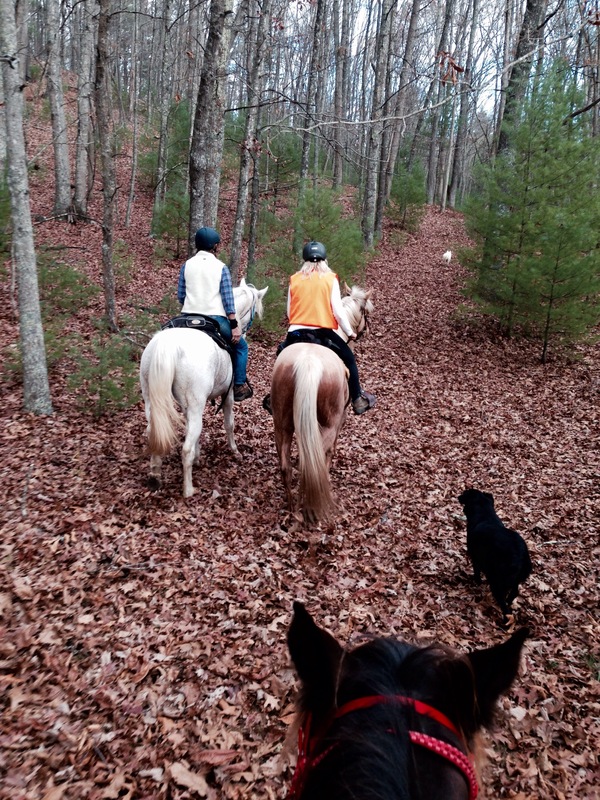 We kept up an average moving speed close to 6mph and the horses seemed to have a great day. Ned really moves out and if he was in his fast rack Khaleesi does her collected canter to stay with him. 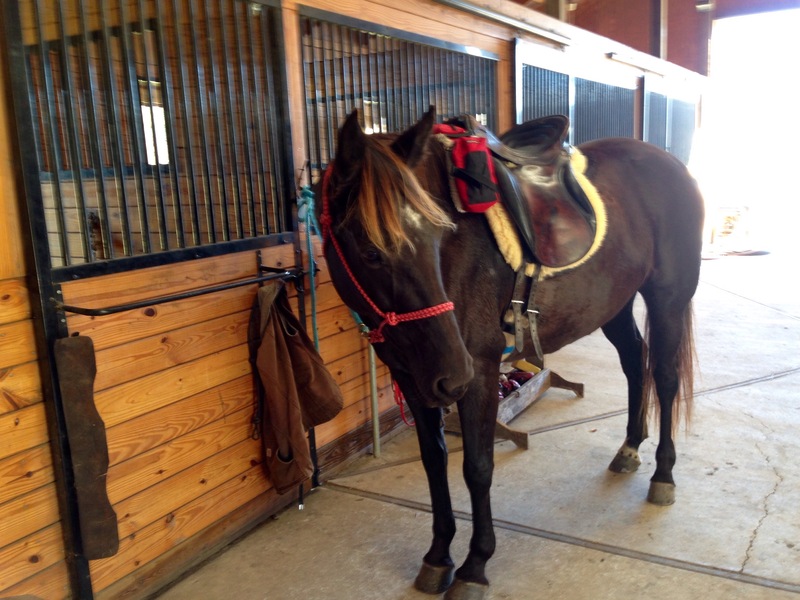 She moved great in the saddle and trotted smooth and easy for me. We tied off the horses for a short break and hiked up to the local look-out gazebo. Horses tied as we climbed the last few feet up some rock stairs to the overlook gazebo. It has been years since I’d gone up there (used to hike it on foot every summer I visited) and it was as beautiful as ever. When I spent summers playing violin at Garth Newel Music Center, Flag Rock was a special place for me and the last year I came for that program I sat on that rock once and was certain I would never see that view or come back to Warm Springs again. I was at a pivotal place in my life and took me 4 years to return and climb out there once again- in 2007 it was as time a full time resident who doesn’t intend to move away any time soon. It was nice to spend a few minutes there- the first time I’d ridden a horse there. Flag Rock- I’ve sat and looked out over the gaps many times over the years, more in the past than recently. 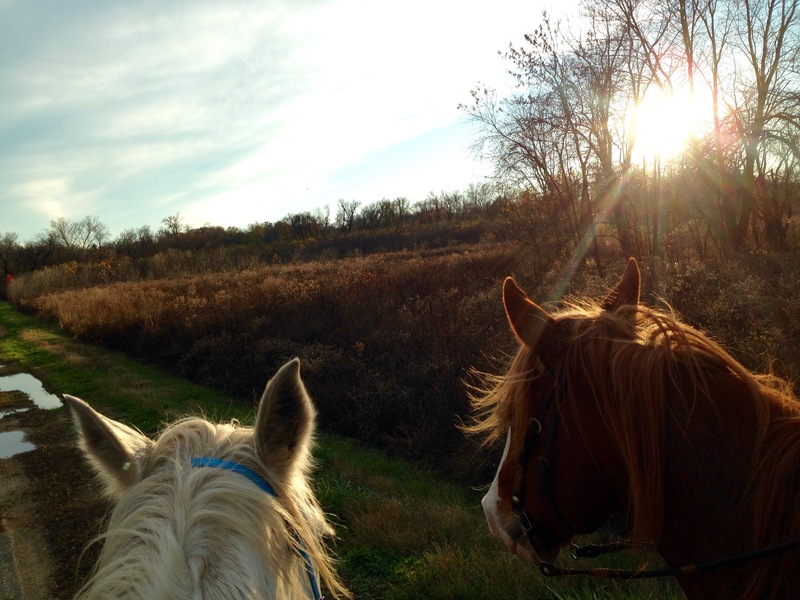 On the ride home we found a few places that were just right and let the horses all out canter. One really pretty stretch we raced them and trusty 18 year old Ned pulled away from Khaleesi even as she tucked her head, bared down, and reached for her biggest stride. She was trying, but that Saddlebred kept his lead and we laughed out loud from the fun of a good run. hey there, this is new… is she out of control right now, could we stop!? But she’s never run away with me and when I ask her to back down she always does. 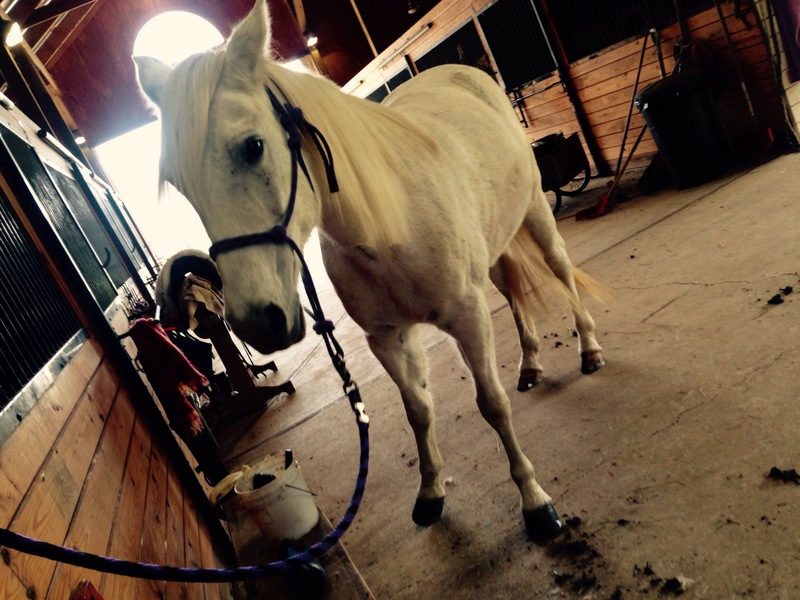 I have been feeling her gaits change and grow as she develops her muscles and tendons and we balance together. I think her canter has taken some time to sort itself out with a rider up there and will continue to develop. 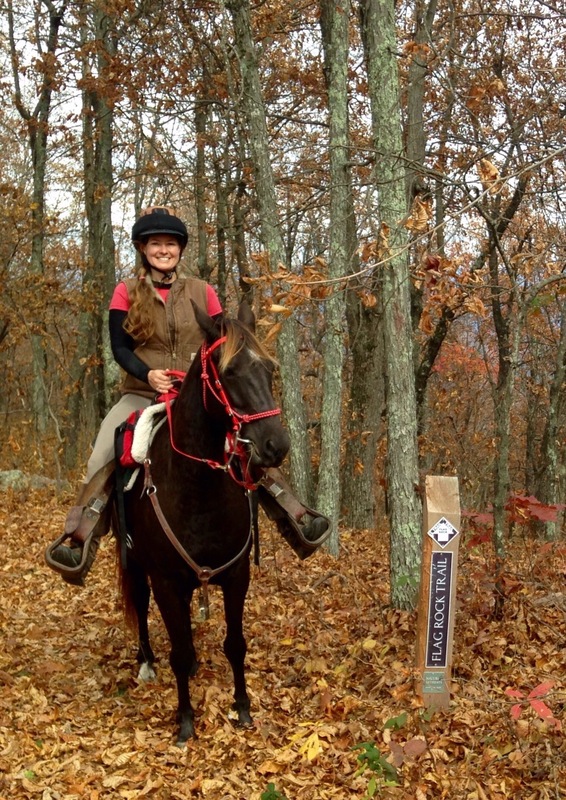 I’ve also heard endurance riders talk about her trot gaining speed and efficiency slowly with practice and time. I believe she may eventually have a rack or running walk develop as well, but we are not in a hurry- it takes time to really build those muscles. We enjoyed the ride, did almost 20 miles in about 3 1/2 hours and saw some beautiful views. pros– love the customization (not just fitting the horse, but the options I can choose or forego to make it streamlined or build up anything I want), know I can have it refitted if the horse changes- or I change horses someday. Small company. Great customer service. Good potential for used saddles to pop up and good records of each saddle’s specifics- the owners of the company can tell me if it’s a decent fit for me and my horse or not from the serial #. I Like the English style rigging at an angle that pulls from the center of the saddle not just the front. 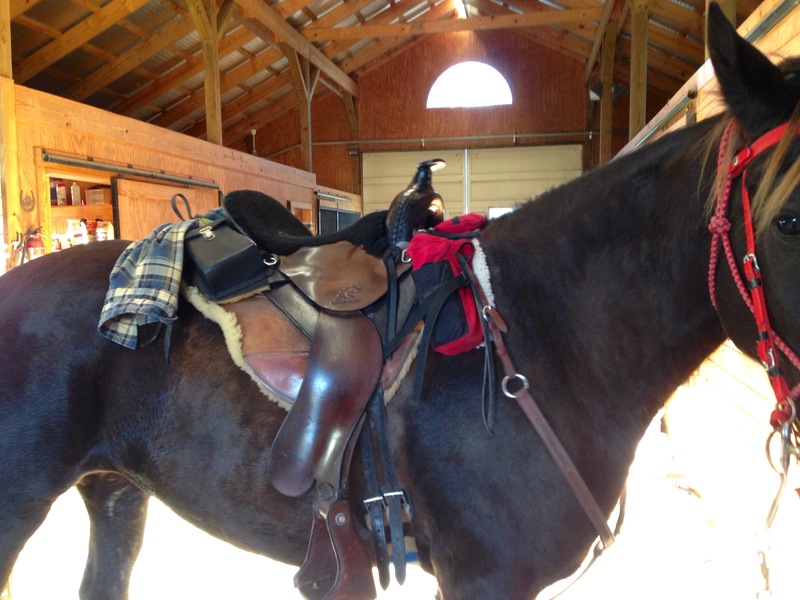 Saddle holds me more in place making the ride easy on me, which is good for my horse. I like their look. cons– if a used one doesn’t pop up- they are pricey. Saddle holds me in place, that is in both pro and con section because I’m not sure how I feel about it it. I like it but it doesn’t give me much room for my own balance/adjustment. Maybe a larger seat would change that. pros– love the one I already have. Every time I ride in it I love it more. Small company. Amazing customer service. Comfortable balanced ride without holding me too much in place. I like the design that is not a flex tree but allows for lots of back movement and muscle development. I already have a relationship with the company and owner and they have been fantastic at every turn. Saddles are not cheap, but very reasonable and cost less than other options I’m considering. Might be better suited to her movement if she eventually picks up a rack or other smooth gait. cons– bulky. The cantle is more substantial that I like and the stirrup fenders are more than I want. Even the light version is not truly lightweight. I’ve contacted the company to ask if there IS any room for adjustment in what they do to streamline it… the good news is there are a few custom things they can do for me to make the saddle closer to what I’m looking for (that might be back to a “pro”). There are almost never used ones for sale… I suppose that can be a pro too- it says people keep them. Something I’ve noticed that’s changed in my thinking about riding is how I quantify a ride. It used to be hours of a ride… a 3 hour ride… a 4 hour ride… an 8 hour ride… but now I tend to think in terms of miles. I don’t mind a slower ride for a short distance (5-8 miles), but now if I’m going to do 15 or 20 miles I’d prefer to move out and cover some ground. 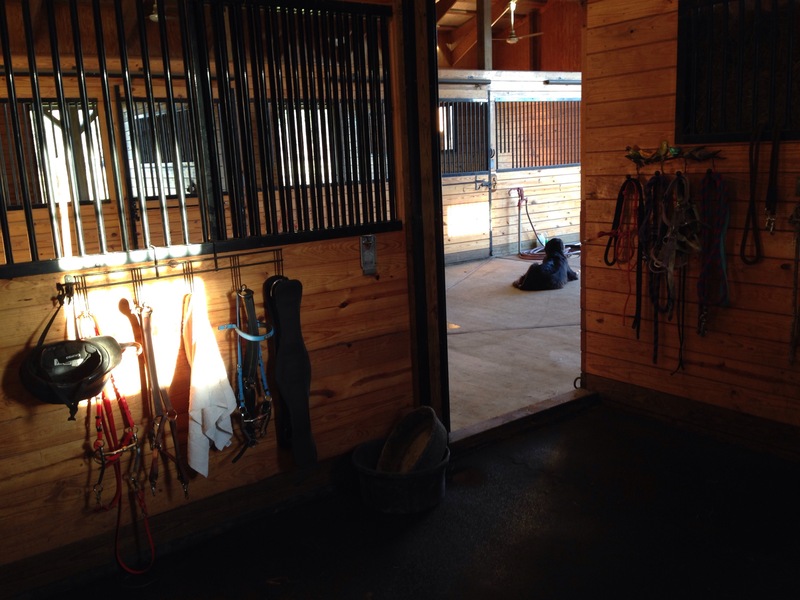 I am fine to spend 8 hours in the saddle, but if I can cover the same territory and see the same things in 5 hours, and moving out keeps my blood flowing and muscles moving so I’m less tired I find that more fun. In the future if I do 8-10 hours in the saddle I hope that means I’m on a 50 mile ride. Since this season of our first LD (25-30 miles) rides I’ve noticed I’m less tired and feel better after 30 miles of moving at a faster pace than 15 miles of mostly walking with occasional spurts of trotting/gaiting. Carrington’s horses (both Ned and Abaco) are great training partners for Khaleesi. In riding only 2 of us there is less of a group dynamic to sort out and we can just get side-by-side and keep a steady pace which is really helpful for me in training. One thing I want to improve is sticking with a pace longer and getting into a rhythm. I’ve read a lot about conditioning LSD (Long Slow Distance) but when you get into the specifics, “Slow” means 5-6mph. 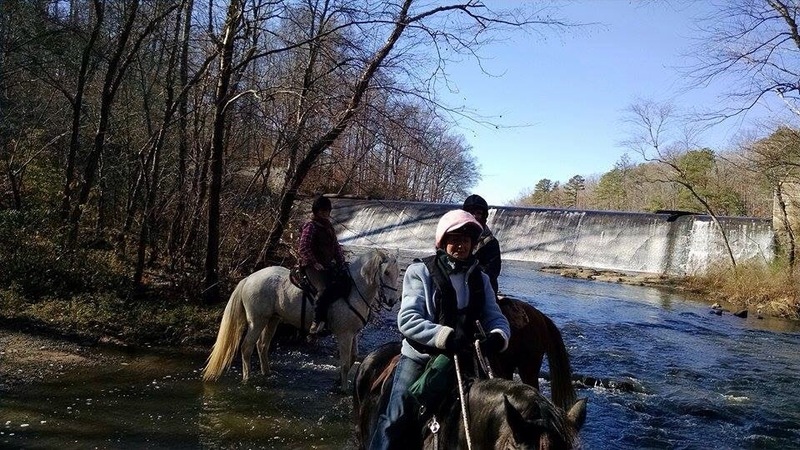 For my neck of the woods most trail rides are in the 3-4mph range if you’re in a group who will keep along- and they are considered the gaited horse- faster moving riders. The quarter horse folks are under 3mph as they walk along enjoying a stroll (nothing wrong with that if you enjoy it!). 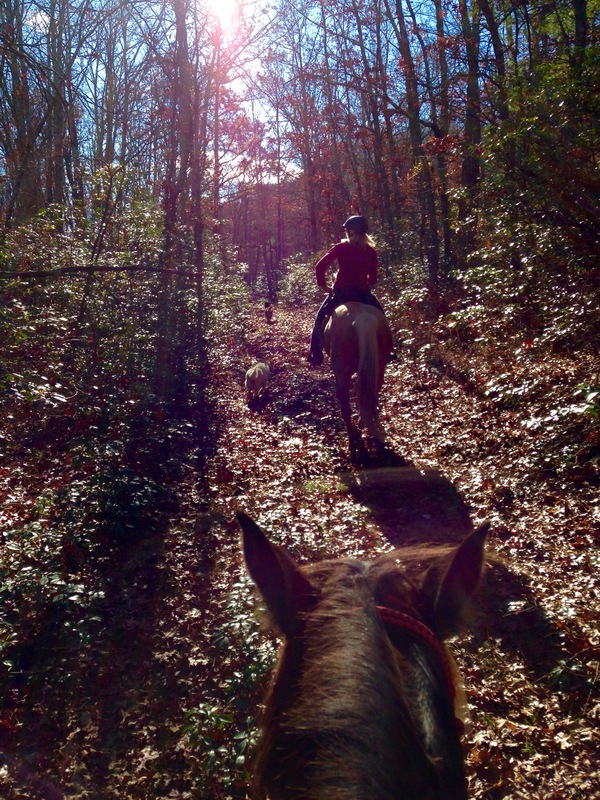 I don’t find it hard to enjoy the view at 5mph- and it encourages me to keep my eyes UP as we ride and not worrying the footing (she does great when I let her to it- I am so much better at NOT looking down anymore). It’s harder to get my solo horse to really focus on moving along at 6mph on our own for consistent stretches, but with Ned or Abaco she will perk up her ears and they get to business. I don’t worry about this. When I started ponying her last winter I called her the “anchor” and when I started riding her I thought she would fall over from lack inertia she walked so slow. In the spring she would move into the lead horse position and just stop altogether. This weekend she took the lead regularly and trotted along in front of Ned at a good clip as well as riding side-by-side and behind. I think she will continue to develop the discipline of riding longer stretches on her own at a faster pace and we will enjoy a good walk with friends sometimes as well. As winter approaches footing and weather make for slower and shorter riding but hopefully as spring emerges next year we can find a ride with Carrington here and there to help me and Khaleesi get back into stride for starting 50s this year. 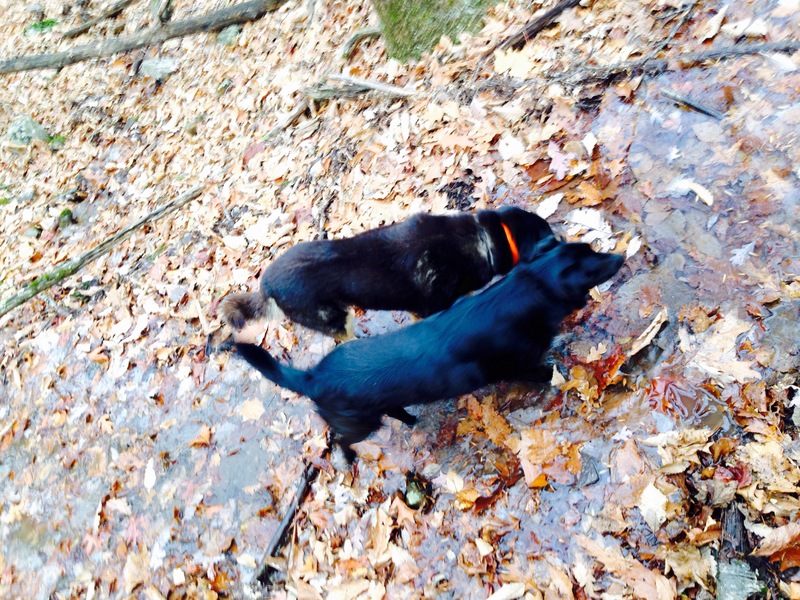 Who knows… maybe Carrington and Ned (or Abaco) will decide to join us at a ride for fun one day! 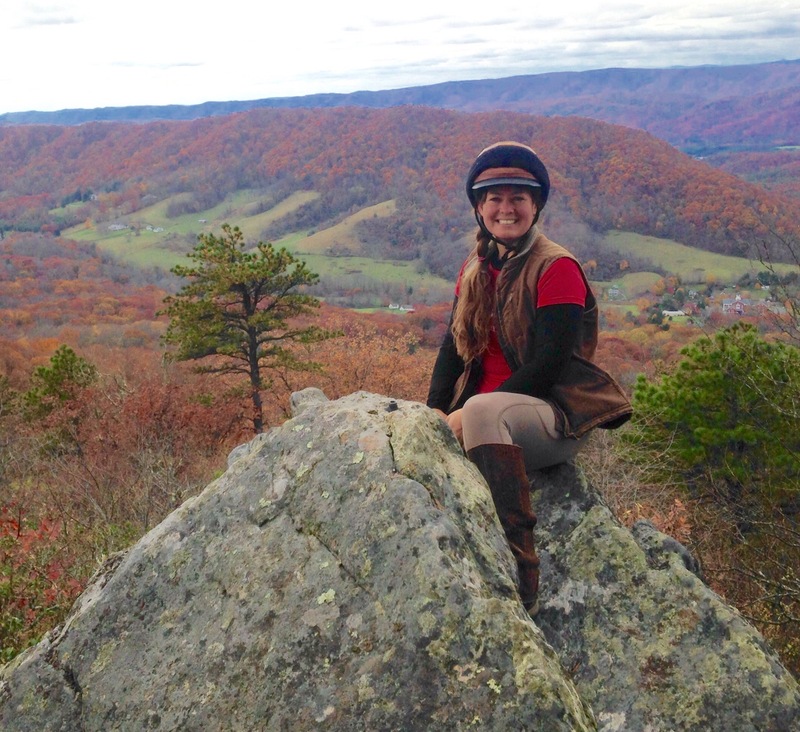 Mountain top ridge riding, river valleys, the slow and the fast, with friends and gone solo: enjoy the ride. …. 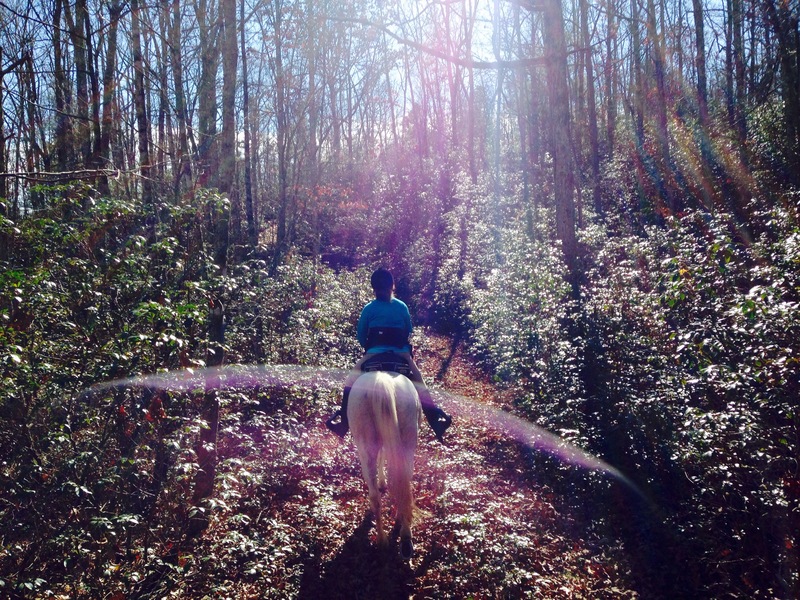 continued saga of finding the right saddle…. 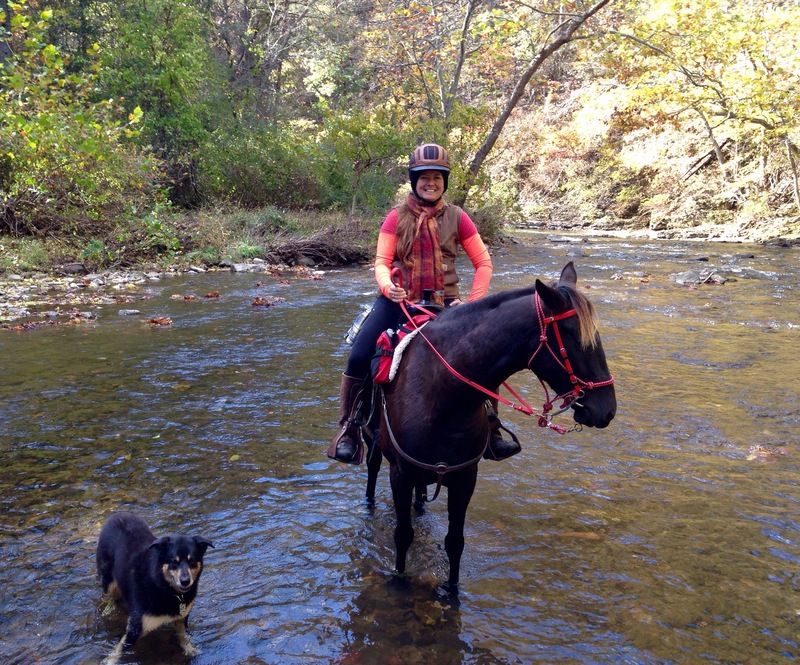 I took a lovely ride with friends along the Jackson River borrowing my friend’s Synergist endurance saddle [this one not for sale]. Synergist saddles are all about the custom fit- for the person and the horse. They even will send you a mold and do their best to get their panels to fit as exactly as possible your horses’ back. They are specific about the angles and distances in a woman’s vs a man’s seat (it seems like overkill to me at first glance) and try to put you as the rider in the most balanced position possible on the horse. I had ridden in this saddle before on a different horse and felt very uncomfortable in it. The horse was gaited and to me there is a difference in the position you use to encourage a nice gait vs. the position I use to post a trot. I had a hard time getting the horse a year ago to gait nicely in the saddle- and my own position was different from riding mostly gaited horses. My hips and knees bothered me once I got off. However this time- on Khaleesi I loved it. 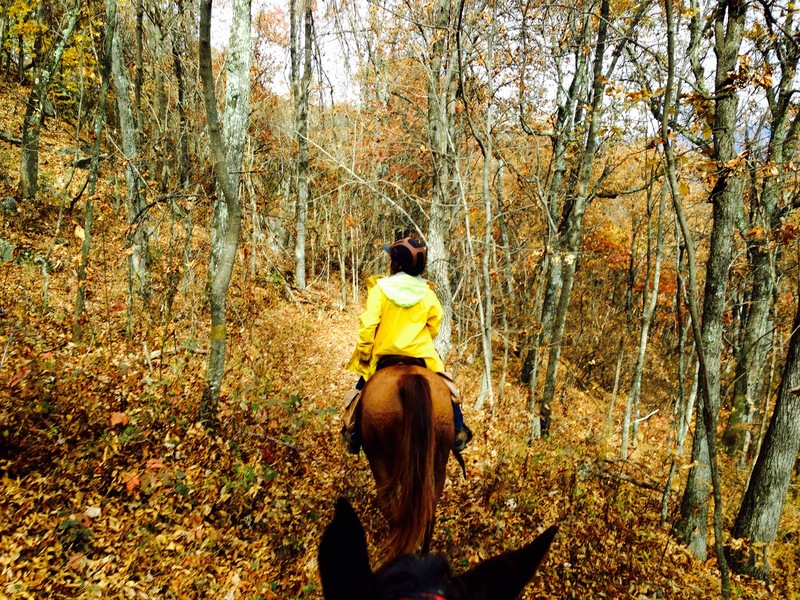 From hopping into the saddle I felt like I was comfortably poised in exactly the right position without being stiff. Of course this also meant I felt like it was easy to sit balanced without having to work so hard at it. (is that cheating?) We moved together with ease and it really felt nice. As for Khaleesi- she seemed to move great underneath me. I had no trouble communicating with her and she had a great trot and canter for the ride which was at least 15 miles. She also seemed happy and foreword and didn’t exhibit any signs of pain or stress. Her ears were forward and we went in all positions of the ride, front, middle and back without much fuss. I got down to feel a little stiff in one knee, but basically great. The saddle isn’t (of course) custom made for Khalees or me, but the fit was ‘decent’ enough to try a ride or two. She had a pretty good sweat pattern with two spots that were a little dry but it wasn’t bad. It was enough for me to contact the company with a few questions of what I might look for in a used saddle if we decided to go that route. I am going to do a quick measurement or two and give them my friend’s saddle number to see how close that saddle would be to fitting her and me, and then the company can help steer me toward used saddles that are the closest fit off the rack- we may not have to go the whole mold-fitted routine. Our next trial was to ride in a borrowed ortho-flex [this one is for sale]. I love the idea of the orthoflex tree and considering it is a saddle my friend would like to sell, it would be great if it was a match for us. Basically ortho-flex makes a saddle on panels that have the ability to give and flex with the movement of the horse’s back. Also, the rider is slightly suspended above the panels and the seat is connected at 4 points in front and back of the seat/panels which means not directly underneath the rider’s seat. This concept is great as it distributes the pressure along a large surface area. Basic physics dictates that the larger the surface area to distribute the pressure the less pressure in any one place there will be. I put it on and the fit seemed pretty good when it came to how it sat on her back. My concern was that the panels extend more forward at front than I liked to see for her. She has a lot of movement and though I realize the panels DO have the ability to flex, they were still there on her shoulders and are pretty stiff/hard- also the rear of the panels sat down on her back and I wondered if they would push in behind me at the place the seat is attached. But the concept of them being flexible was in my mind as we headed out to see how it worked for us. The first thing I noticed was it was harder to get my leg cues in, either to move forward or side- I had a hard time getting my foot to her actual side past the english flaps and the sheepskin pad. To ask her to move I really had to give her a good kick. Next, I felt all my communication that we’d been getting so much better at was working through a filter. I was sitting off her back which I believe was probably good for not creating pressure points- but at the same time it was also taking away the contact altogether. Unfortunately in our case, I don’t think she felt great in the saddle either. Her stride was shorter in everything from walk to trot to canter. Her back legs didn’t seem to get underneath her like I’m used to and she tripped or slipped on her back feet more than usual. She tried to turn me around as well (lately she’s been pretty good about going out happily with me- so though I can chalk part of that up to not wanting to leave her friends…) it was notable that at least once she REALLY tried to convince me to turn home. I didn’t let her and though we did cut the ride a little shorter than I’d planned, I wanted to get a decent amount of time in the saddle. When I did turn her home at first she happily trotted off but though I was ready for her to try to push me home, she would trot a few steps then return to a walk. A couple of times I asked her to canter, one time she really decided to push with a fast pace up a hill, it was a short stride bunny hop feeling canter that just went really fast. As we neared home I tried to really put my finger on how we felt that day and the description I came up with was robotic- I felt slightly jerky and off kilter. I had a hard time keeping my feet underneath me but I chose the middle stirrup setting and probably would have been better with the one most under my seat. One thing that is for certain as I’m on this saddle choosing exploration- between reading other people’s thoughts and the saddles I’ve ridden in myself- it is an incredibly personal and individual journey. I have looked up posts and blogs and just about every saddle has people who sear by them as the only reasonable option and people who say they are terrible and no horse should ever be ridden in one. I have already been quite amazed at the different feel for myself and for her depending on the saddle. I assumed saddles would make a difference- but I’m even surprised myself at how big of a difference in both of us it can make. 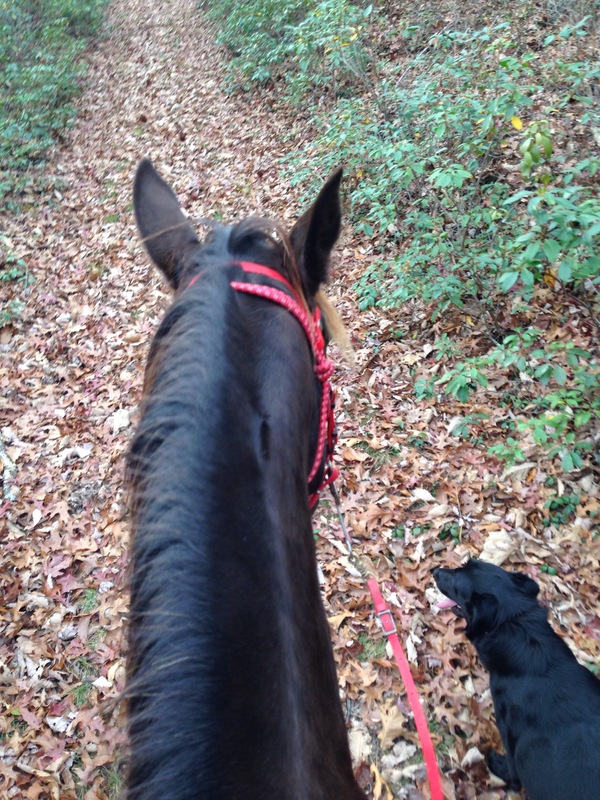 Just the few I’ve started with have convinced me that this process is worthwhile to find the feel that I want on the long miles of trail of an endurance rider, and the saddle that helps Khaleesi move and feel her best as well. I am much more determined to beg, borrow and take on trial until we really find the right match- and hope that a couple of miles will give us the data we need to really know what will work long term. what Khaleesi thinks about saddle fitting. I still have a few local options to borrow- then I may consider doing a loan-order from a couple reputable companies as well before making any real decision. 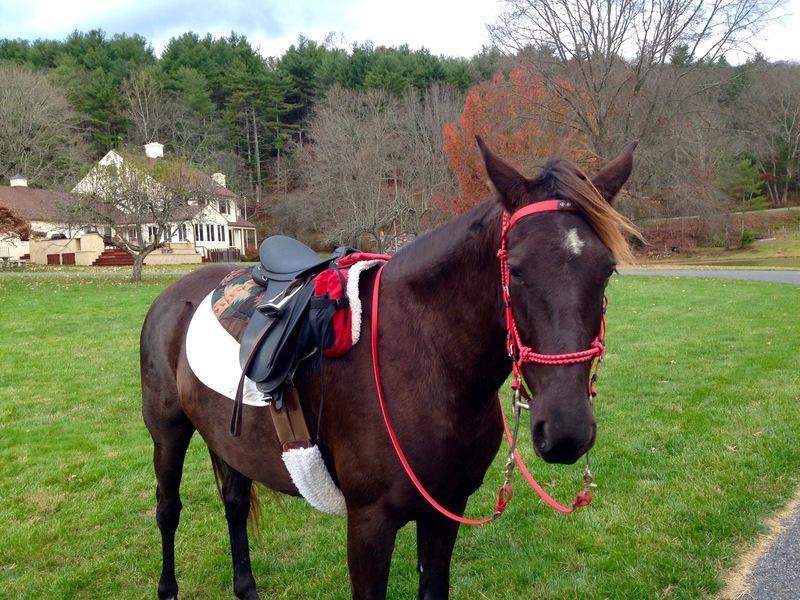 I have a friend who swears by her Ansur saddle and has agreed to loan it to me for a ride. Honestly I hope I we don’t love that one because they cost a fortune! I love the Phoenix Rising (IMUS) saddle I chose for Faygo. Every time I ride her in it- it feels like “home”. In talking to the company it appears Khaleesi is more likely a standard tree (Faygo is wide) so I plan to ride with a friend who has an extra hubby saddle the right fit to see how she does in that one. I have also heard lots of great reviews about Specialized so if I can’t borrow one I plan to do a loaner saddle in that brand just to see. I like the lighter weight of their Eurolight model. Once I get narrowed down to a couple top choices, I suppose that will be the time to visit some saddle fitting contacts and see what the pressure pad and the professionals think. One thing I’ve been thinking about is the difference between an all-purpose english style saddle that we’ve been working in up till now and saddle more designed for long trails. I believe I’d like to always have something like my Wintec (hoping I can get the flocking or CAIR system fixed) for working on our balance, training (mine and hers!) and communication, then something built on a trail/endurance tree for our longer distances. I believe that the panels on most of the saddles I’m considering are slightly wider (meaning surface area, not a wider tree) and will distribute weight better for many hours in the saddle, and if a saddle helps me stay more balanced (cheating?) I think for long rides that could be good for both she and I as long as it doesn’t inhibit communication by being rigid. I am starting to think that having a streamlined saddle for learning and a trail saddle for long rides might be a good choice for us. 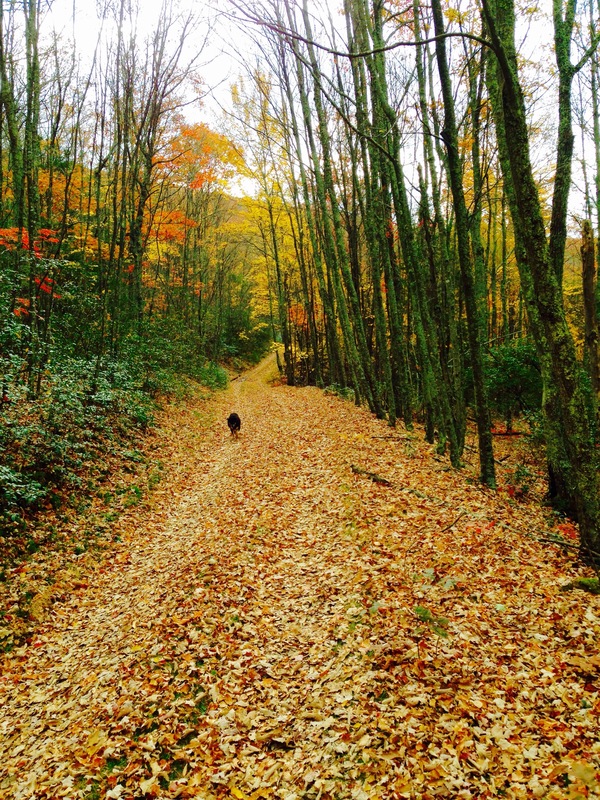 Meanwhile, we’re still getting some nice fall rides in!